How can recruiters combat the talent crunch, and increase candidate flow? Here are 3 ways! This isn’t a quick fix…but your reputation precedes you. Appcast recruitment media benchmarks research shows that your Glassdoor rating impacts candidate acquisition cost and volume. 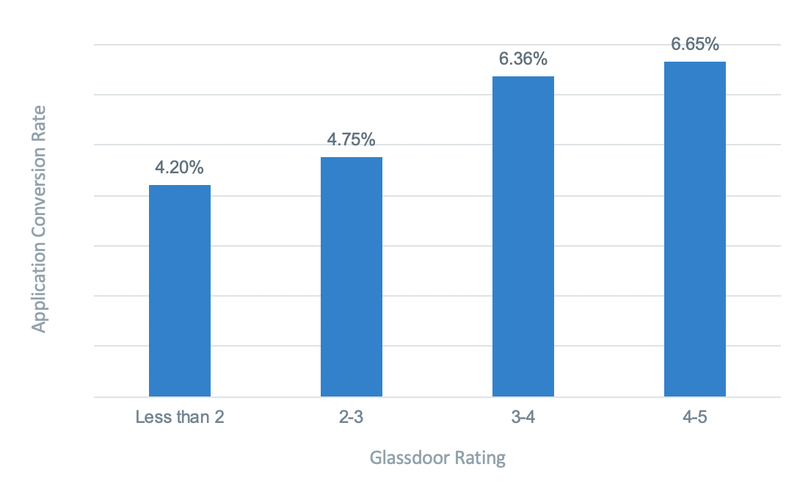 Organizations with a higher Glassdoor profile rating attract more candidates on job ads than those with a lower one. On average, a higher Glassdoor rating lead to an almost ~50% increase in application conversion rates. That means that every positive employee review your organization has on Glassdoor can have a massive impact on the likelihood that job seekers will see, click on, and actually apply to your jobs. 2. Improve your job ads! Try to keep your job titles as concise & clear as possible. The highest performing job ads (with a 7.6% apply rate) have titles with between 1 – 3 words; being clever takes a backseat to being concise. Review your job descriptions to balance the amount of information you provide. Include only necessary information in the description; paint an honest and accurate picture of the role and your organization, while staying within the sweet spot of 300-800 words. Remove symbols such as %, $, &, and ! from your job titles. 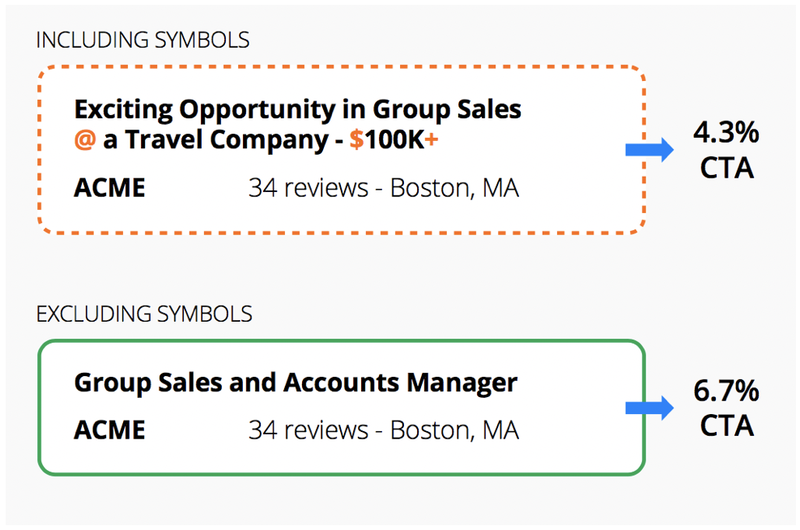 Job ads with symbols in the title have a lower click-through rate, and using 2+ symbols in job ad titles caused the apply rate to fall by ~30%. Avoid symbols to eliminate the risk of candidate drop off. Mentioning benefits to encourage candidates to apply: There is a direct correlation between application conversion rate and the number of non-cash benefits listed in a job description. Include mentions of medical insurance, employee discounts, travel perks, and office benefits to attract more candidates. The more non-cash benefits you include in your job description, the higher your click-to-apply rate will be. Keep the apply process short and sweet. 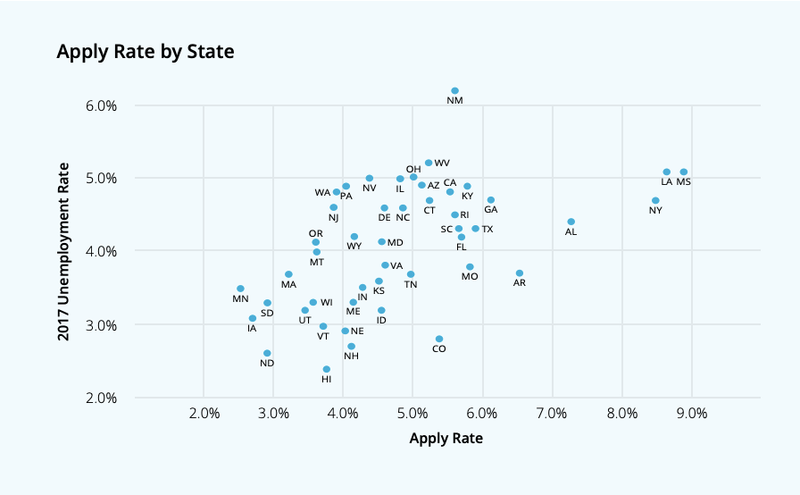 Our data shows that lengthy, complex and time-consuming applications act as a barrier to applicants. Applications that take more than 15 minutes to complete experience a 365% degradation in completion rates. Reduce your application time to five minutes or less to increase your click-to-apply rates, and lower your overall recruitment costs. It’s more important than ever before to understand the industry and keep up with the times. Educate yourself on new sources available to you and think about ways you can be an “early adopter” and beat out your competitors. Look into social networks and other new players as candidate sources. Google, Facebook, Instagram, and LinkedIn hold untapped potential for driving candidate volume. Each tool serves its own unique purpose for recruiters, both in advertising (Google and LinkedIn) and in candidate research (Facebook and Instagram). One new method that recruiters are now exploring is one-to-one text communication with candidates. 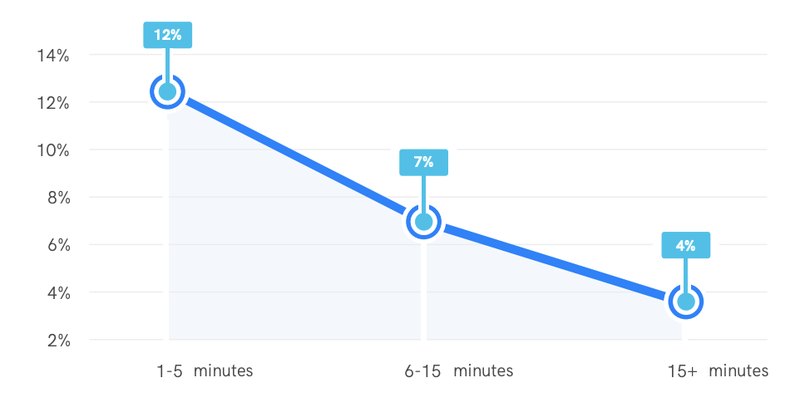 When texting back and forth with candidates, you can get a reply in seconds to minutes, versus the hours and days it can take to receive a reply via email. According to Jobvite’s Recruiter Nation Study, Roughly 43% of recruiters have tried texting, and 88% have had positive feedback from candidates, while only 4% have had negative feedback. New technologies such as programmatic ad buying are helping employers drive volume on the jobs that need more applicants and eliminating wasted spend. Programmatic job advertising helps organizations reach their goals, and drive more applicant volume across as many jobs as possible. Advertisers can build campaigns to allocate budget towards the jobs that need more volume, and save budget on the jobs that already have enough applicants. Programmatic gives you total control of your recruitment budget, with rules-based automation at the helm to help optimize and maximize every dollar spent on job advertising. There’s no doubt that the competition for candidates is steep. But by following the tips outlined above, you can ensure that your organization stays ahead of the curve. 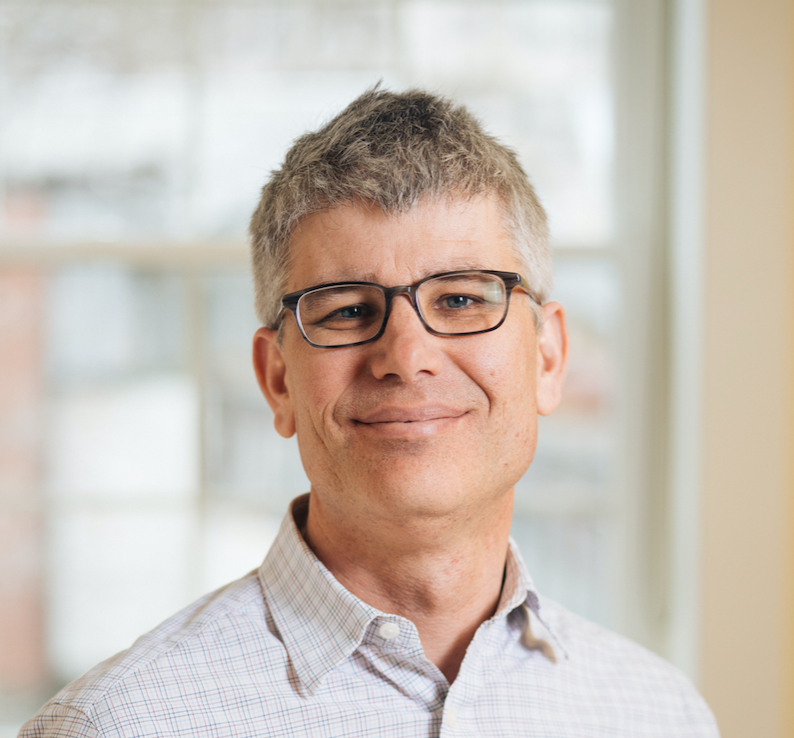 To get the full scoop on how to combat today’s talent crunch, watch our most recent webinar with Jobvite, How to Increase Candidate Flow in the Toughest Labor Market Ever.